Google, Yahoo and Bing news pick up press releases submitted to our feeds. Click here to view placements. $9.95 submission includes a single WebMediaWire.com news feed posting. Submission information will be provided upon completion of payment. Click here to view our advanced features that are only available to our Premium Service customers. Account login information will be provided upon completion of payment. After purchasing via PayPal, you will be forwarded to information regarding how to submit your item. All submissions are reviewed during normal business hours M-F 10am-5pm PST before being sent live. All sales are final. Please contact us if there is a problem submitting an item. All submissions are subject to approval and will be reviewed during normal business hours M-F 10am-5pm PST before being activated. Google and Yahoo news require that all news items be valid news items. Scams and "get rich quick" schemes do not qualify as valid news items and will not be posted. 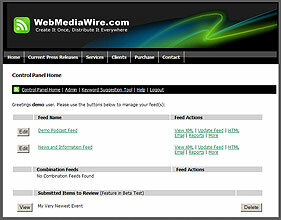 This service is offered by WebMediaWire.com, a Mac Millan Interactive Commmunications, LLC website property. We are located in Los Angeles, CA and you can contact us at (818) 567-2821, from 9am-5pm PST M-F if you have any questions. We are an American owned and operated business that has provided web communications services since 1995. * Press release inclusion guarantee is dependent upon the press release being a valid news story and not simply an advertisement.